Surfaces may be smoothed in a variety of different ways. Many of the interpolation methods described in Sections 6.6, Deterministic Interpolation Methods and 6.7, Geostatistical Interpolation Methods, may be described as surface smoothing functions, since they provide estimates that do not pass exactly through the point sets provided. 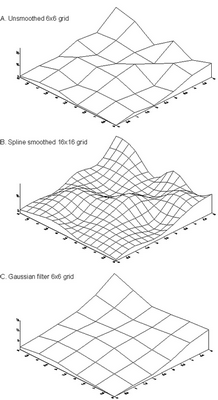 More generally, however, the term smoothing for surfaces refers to procedures that amend an existing grid. This is achieved through one of three main methods: (i) resolution increase (this may be the main objective of the procedure); (ii) grid recalculation, which if the grid has fewer rows and columns than the original is sometimes described as thinning; and (iii) filtering or kernel smoothing, involving operations on NxN windows or kernels. Smoothing operations that are terrain-specific (e.g. filling pits in a surface) are discussed separately in Section 6.2.6, Pit filling. Smoothing a grid by resolution increase involves increasing the number of nodes or cells and then fitting an exact smoothing interpolator through these points and the original set. Typically the function used will be a bicubic spline. Figure 6‑18A shows a low resolution grid (with 6x6 nodes — the same as that illustrated in Figure 6‑8, upper diagram). In Figure 6‑18B this surface has been spline smoothed to provide a 16x16 grid that passes exactly through the original point set, but is also a much smoother surface model. Smoothing a grid by recalculation involves defining the number of grid rows and columns required, and then computing the result by interpolation to this resolution whilst again honoring the original point set. If a recalculated grid has the same number of rows and columns as the original grid no recalculation is carried out. If it is defined as the same resolution as in case (i), the result is an identical grid to that shown in Figure 6‑18B. Applying a filter or kernel to a grid can result in a wide range of effects, one of which is smoothing. Figure 6‑18C illustrates this process for the same source grid, using a 3x3 kernel in which the central weight is 4, the NSEW position weights are 2, and the diagonal weights 1 (as described in Section 4.6.2, Linear spatial filtering). The total weighting is thus 16, so the result is divided by 16 after each grid position has been adjusted using this kernel. This is a form of simple weighted average, in this case often described as a Gaussian kernel owing to the general symmetric, center-weighted kernel form applied. This procedure is very similar to operations that are standard in image processing, such as edge detection and de-blurring.